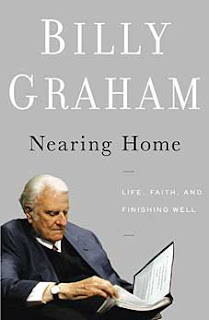 As one who followed Billy Graham’s ministry since I was a young boy, I was anxious to read his latest book Nearing Home in which he graciously shares his reflections on growing old...and finishing well. Citing examples of several heroes of the faith including Noah, Enoch, David and Zechariah he points out that God continues to use His children even in their advanced years. The reader is encouraged to finish strong and not drop out of the race. He cites several perils which an older person may face. He lists fear, depression, anger, intense loneliness and becoming absorbed in our own problems as issues we will likely battle. Graham challenges the reader to leave a legacy for those who come behind us and also to attempt to resolve relational conflicts before it is too late. Of course he takes an opportunity to simply share the gospel story again as he has done thousands of times throughout his ministry. The book is an easy read with many personal vignettes from Billy Graham’s life but I found the chapter concerning financial planning, mastering your money and insuring that a will is in place was more difficult to get through. Nearing Home confirmed what I had already determined many years ago. Billy Graham is a godly man who has lived well and is filled with hope as he is nearing home. I highly recommend this book. Thank you! Have a blessed and wonderful Christmas! Thanks for the Christmas Eve Suggestion and I will look for it. Enjoy the season Dave. And by the way, charming blog.